This BMJournal is a music journal in a plastic-covered file with plastic pockets in which I have inserted a variety of manuscript paper. These can be reallocated to the pockets the moocher uses, one or two sheets to a pocket, arranged so the music is on a separate sheet from that of other contributors; or music can be printed or hand written on your preferred paper and inserted. If you can’t write music, sol-fa is acceptable, but I’d like the rhythm as well. I would like the folder sent back to me (I’ll mooch it!) to reach me in late September of each year here in the UK, and I will add new pockets and transcribe the music onto Sibelius before remooching it. I collect carols that are out of copyright from as many countries as I can, and make arrangements for my ‘cello pupils. Each Christmas eve they come and play them in a carol concert for their parents and families in my converted barn, 20 to 24 each year. We hope not to repeat the same arrangement/version for at least 10 years! Last year they played two original carols of mine, and one will be included as my contribution to the journal. It is an arrangement for 8 ‘cellos with words in Welsh. If you contribute, please include words in your own language, so far we have made the parents and partners sing in Welsh, English, French, German, Dutch, Spanish, Italian, Czech, American, Jamaican patois, Latin, Polish.. I’m sure we can do better than that! 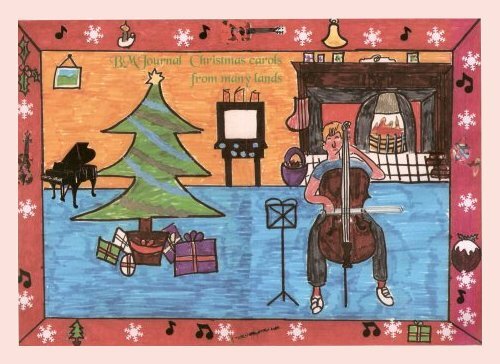 This year we are planning to make them all play ‘cello with a carol taught to them by their children/partner!